Do you drive distracted or impaired? 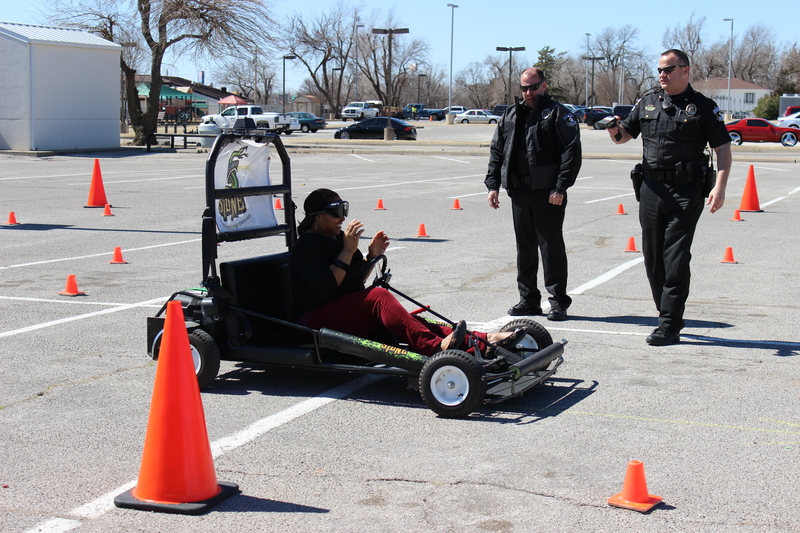 The Oklahoma County Sheriff’s Office visited RSC on March 12 with its Simulated Impaired Driving Experience vehicle to educate the campus about the dangers of distracted and impaired driving. According to the National Highway Traffic Safety Administration, more than 10,000 people died in alcohol-impaired driving crashes in 2012; that is one death every 51 minutes. The CDC website describes distracted driving as performing an activity that takes attention away from driving and lists three main types of distraction: visual (taking eyes off the road), manual (taking hands off the wheel) and cognitive (taking the mind off driving). Lt. Jason Yingling of the Oklahoma County Sheriff’s Office spoke at the Distracted/Impaired Driver Exhibit to educate students, faculty and staff about the “cost” of drunk and distracted driving. “An average text, for instance, takes between 4.6 to 5 seconds, and at 55 miles per hour that’s like driving the length of a football field completely blind-folded. I think driving and paying attention to what we’re doing out there is coming secondary now with technology advancements,” Yingling said. The exhibit works to educate people about staying focused on the road and making good choices. “For those who choose not to, there are consequences for their actions,” he said. He explained that his job as an officer is solely to catch and arrest drunken drivers for driving under the influence, and he does it “without apology” because of his experiences in the field. “Back in 2011 the game changed for DUIs in the state of Oklahoma,” Yingling said. That year, Gov. Mary Fallin signed the Erin Swezey Act into law, “which is named for the 20-year-old Oklahoma State University student from Edmond who was killed in 2009 by a drunken driver with numerous DUI arrests and convictions,” according to oksenate.gov. Yingling said the drunken driver who killed Swezey in a head-on collision on the Kilpatrick Turnpike was driving on the wrong side of the road at more than 100 mph and had a blood alcohol content of .29, more than three times the legal limit; his license had been revoked six times in eight years for previous DUI arrests. “Erin’s parents were very mad when they learned that their daughter had been killed by a person who should be in prison,” Yingling said. Swezey’s parents, Keith and Dixie Swezey, garnered media attention and at their request, Sen. Clark Jolley, R-Edmond, authored Senate Bill 529 that became the Erin Swezey Act. It requires “greater use of mandatory interlock devices as a way to keep more drunken drivers off the road and reduce fatalities,” according to oksenate.gov. Yingling said the Erin Swezey Act also added humiliation factors such as having “DUI conviction” stamped across an offender’s driver’s license. The act also tripled the cost of DUI fines and fees, he said. Taking all possible expenses associated with a DUI conviction into consideration, Yingling said he estimates the financial cost to be between $10,000 and $14,000 under the new law. “I think with a combination of enforcement and education to the public, maybe we can make a little bit of a difference,” he said. “That’s our main goal out here.” Bringing the exhibit to RSC is the education part of that goal. Tate-Britt said she felt impaired while driving on the course; her vision was blurry, she couldn’t stop blinking, and it was very difficult to avoid striking the traffic cones. She noted that the simulated impairment caused her to drive extra slow.